Brother Bear is a 2003 American animated film produced by Walt Disney Feature Animation and released by Walt Disney Pictures. It is the 44th Disney animated feature film. In the film, an Inuit boy named Kenai pursues a bear in revenge for a battle that he provoked in which his oldest brother Sitka is killed. He tracks down the bear and kills it, but the Spirits, angered by this needless death, change Kenai into a bear himself as punishment. In order to be human again, Kenai must travel to a mountain where the Northern lights touch the earth. On his way, Kenai is reclutantly guided by a bear cub, and learns to see through another's eyes, feel through another's heart, and discovers the meaning of brotherhood. The film was the third and final Disney animated feature produced primarily by the Feature Animation studio at Disney-MGM Studios in Orlando, Florida; the studio was shut down in March 2004, not long after the release of this film in favor of computer animated features. The film received an Academy Award nomination for Best Animated Feature. A direct-to-video sequel, Brother Bear 2, was released on August 29, 2006. The film is set in a post-ice age Alaska, where the local tribesmen believe all creatures are created through the Spirits, who are said to appear in the form of an aurora. Three brothers (Kenai, the youngest brother; Denahi, the middle brother; and Sitka, the eldest brother) return to their tribe in order for Kenai to receive his totem, a necklace in the shape of an animal. The particular animal it represents symbolizes what he must achieve to call himself a man. Unlike Sitka, who gained the eagle of guidance, and Denahi, who gained the wolf of wisdom, Kenai receives the bear of love. He objects to this, stating that bears are thieves, and believes his point is made a fact when a bear takes some salmon. Kenai and his brothers pursue the bear, but a fight follows on a glacier, during which Sitka gives his life to save his brothers, although the bear survives. Angered, Kenai heads out to avenge Sitka. He chases the bear up onto a mountain and kills it. The Spirits, represented by Sitka's spirit in the form of a bald eagle, transform Kenai into a bear after the dead bear's body evaporates. Denahi arrives, mistaking Kenai as dead, and believing his bear form is responsible, vows to avenge Kenai by hunting it down. Kenai falls down some rapids, survives, and is healed by Tanana, the shaman of Kenai's tribe. She does not speak the bear language, but advises him to return to the mountain to find Sitka and be turned back to normal, but only when he amends his mistake; she disappears without an explanation. Kenai quickly discovers the wildlife can talk, meeting two brother moose, Rutt and Tuke. He gets caught in a trap, but is freed by an outgoing bear cub named Koda. They make a deal: Kenai will go with Koda to a nearby salmon run and then the cub will lead Kenai to the mountain. As the two eventually form a sibling-like attachment, Koda reveals that his mother is missing. The two are hunted by Denahi, who is still determined to avenge Kenai, unaware that the bear he is pursuing is actually Kenai. Eventually, Kenai and Koda reach the salmon run, where a large number of bears live as a family, including the leader Tug, a grizzly bear. Kenai adjusts to his surroundings and is happy living with the other bears. During a discussion among the bears, Koda tells a story about his mother fighting human hunters, making Kenai realize that the bear he killed was Koda's mother. Shocked and horrified at what he has done, Kenai runs away in a fit of guilt, but Koda soon finds him. Kenai reveals the truth to Koda, who runs away, grief-stricken. An apologetic Kenai leaves to reach the mountain. Rutt and Tuke, having had a falling out, reform their brotherhood in front of Koda, prompting him to go after Kenai. Denahi confronts Kenai on the mountain, but their fight is interrupted by Koda, who steals Denahi's hunting pike. Kenai goes to Koda's aid out of love, prompting Sitka to appear and turn him back into a human, much to Denahi and Koda's surprise. However, upon realizing that Koda needs him because of his own misdeeds, Kenai asks Sitka to transform him back into a bear with Denahi's support. Sitka complies, and Kenai is transformed back into a bear. Koda is reunited briefly with the spirit of his mother, before she and Sitka return to the Spirits. In the end, Kenai lives with the rest of the bears and gains his title as a man, through being a bear. Joaquin Phoenix as Kenai, the younger brother of Sitka and Denahi. After he needlessly kills a bear, Kenai is turned into one himself to teach him to see another's eyes, feel through another's heart, and discover the true meaning of brotherhood. John E. Hurst and Byron Howard served as the supervising animators for Kenai in human and bear form respectively. Jeremy Suarez as Koda, a wisecracking grizzly bear cub who helps Kenai on his journey to where the Lights Touch the Earth. Alex Kupershmidt served as the supervising animator for Koda. Rick Moranis & Dave Thomas as Rutt and Tuke, a comic Canadian moose duo. Jason Raize as Denahi, the middle brother. This was Jason Raize's first and only film role before his death in 2004. Ruben A. Aquino served as the supervising animator for Denahi. D.B. Sweeney as Sitka, the oldest brother. Joan Copeland as Tanana, the shaman-woman of Kenai's tribe. Michael Clarke Duncan as Tug, a wise old grizzly bear. Following the critical and commercial success of The Lion King, Disney chairman and CEO Michael Eisner urged for more animal-centric animated features, and suggested a North American backdrop, taking particular inspiration from an original landscape painting by Albert Bierstadt that he bought. To track the "king" idea, the hero would naturally be a bear, the king of the forest. At the time, the original idea, which was inspired by King Lear, centered around an old blind bear who traveled the forest with his three daughters. In 1997, veteran animator Aaron Blaise came on board the project as director because he "wanted to be attached so that I could animate bears", and was soon joined by co-director Robert Walker. Because Blaise desired a more naturalistic story, Blaise and producer Chuck Williams produced a two-page treatment of a father-son story in which the son is transformed into a bear, and in the end, remains a bear. Thomas Schumacher, then-president of Walt Disney Feature Animation, approved the revised story and proclaimed, "This is the idea of the century." Tab Murphy, who had co-written the screenplays for Tarzan and Atlantis: The Lost Empire, came on board to write an early draft of the script. After the project was green-lit, Blaise, Walker, and the story artists embarked on a research trip in August 1999 to visit Alaska where they traveled on the Valley of Ten Thousand Smokes and Kodiak Island, as well as traveling through Denali National Park and the Kenai Fjords National Park, where they visited Exit and Holgate Glacier. A year later, the production team took additional research trips through the Yellowstone National Park, Grand Teton National Park, and the Sequoia National Park. Around 2000, the story evolved into a tale in which the transformed Kenai is taken in by an older bear, Griz, who was to be voiced by Michael Clarke Duncan. However, Blaise explained that "we were struggling [with the story], trying to get some charm into the film. So we turned Griz into a cub named Koda", who was voiced by Jeremy Suarez. Because Blaise, Walker, and Williams enjoyed Duncan's vocal performance, Tug, the de facto leader of the bears at the salmon run, was written into the film. In March 2001, Joaquin Phoenix confirmed he was cast in the film exclaiming, "Oh, but forget the Oscar nomination [for Gladiator]. The real pinnacle is that I'm playing an animated character in a Disney film. Isn't that the greatest? I play a Native American transformed into a bear. It's called The Bears. Don't call me a leading man. I don't care about that. I'm a leading bear. I am content!" After the filmmakers heard his audition tapes for Finding Nemo, Jeremy Suarez was cast as Koda. Much like contemporary animated films where most of the cast members record their voices separately, Suarez and Phoenix voiced the roles separately, although they both did a recording session together at least two times. Voicing the moose brothers Rutt and Tuke, Dave Thomas and Rick Moranis performed simultaneously throughout the recording process. Angayuqaq Oscar Kawagley, an associate professor who taught courses on Alaska Native philosophy at the University of Alaska, Fairbanks, claimed he was never given a script, but was instead given "the dialogue that they had written, which was being told by a Native person". For the role as the Inuit Narrator, Kawagley translated the dialogue in written form into Yup'ik and faxed the translation back to the Disney studio. He later recorded his translation at an Anchorage studio while being videotaped for animation reference. The film is traditionally animated but includes some CG elements such as "a salmon run and a caribou stampede". Layout artist Armand Serrano, speaking about the drawing process on the film, said that "we had to do a life drawing session with live bear cubs and also outdoor drawing and painting sessions at Fort Wilderness in Florida three times a week for two months [...]".. In 2001, Background supervisor Barry Kooser and his team traveled to Jackson Hole, Wyoming and studied with Western landscape painter Scott Christensen, where they learned to: "simplify objects by getting the spatial dimensions to work first and working in the detail later." According to Ruben Aquino, supervising animator for the character of Denahi, Denahi was originally meant to be Kenai's father; later this was changed to Kenai's brother. Byron Howard, supervising animator for Kenai in bear form, said that earlier in production a bear named Grizz (who resembles Tug in the film and is voiced by the same actor) was supposed to have the role of Kenai's mentor. Art Director Robh Ruppel stated that the ending of the film originally showed how Kenai and Denahi get together once a year to play when the northern lights are in the sky. Following the success of the Tarzan soundtrack, Phil Collins was offered the opportunity to compose songs for Brother Bear, as well as let him "co-write the score". However, Collins explained, "Slowly, the bad news started to trickle down that I wouldn't be singing it all. It was a bit of a disappointment, because I [usually] write songs that I sing myself." While Collins composed six songs for the film, he shared vocal performance duties with Tina Turner, who had announced her retirement from touring and had not released an album since Twenty Four Seven in 1999, who had signed on to sing the opening song, as well as the Blind Boys Of Alabama and the Bulgarian Women's Choir, who performed the song, "Transformation". Collins's lyrics were translated into the Inuit Eskimo language for the performance, which was arranged by score co-composers Collins and Mark Mancina, and vocal arranger Eddie Jobson. Brother Bear was originally slated for a spring 2004 release, while Home on the Range was scheduled for a 2003 release. However, Disney announced that Brother Bear would be released in fall 2003, while Home on the Range was pushed back for a spring 2004 release. Contrary to speculation, news writer Jim Hill stated the release date switch was not because Home on the Range was suffering from story rewrites, but to promote Brother Bear on the Platinum Edition release of The Lion King. On July 15, 2003, Disney announced that the release date would be moved up by one weekend from its previously scheduled slot of November 7, 2003. However, instead of opening on Halloween, the film would be released on Saturday, November 1, 2003. On October 20, 2003, Brother Bear premiered at the New Amsterdam Theatre where fellow attendees included New York Governor George Pataki and cast members Michael Clarke Duncan and Estelle Harris. Following the showing of the film, Collins performed "No Way Out" before introducing Tina Turner to the stage where she performed the opening song, "Great Spirits". Brother Bear was released on VHS and two-disc DVD on March 30, 2004. The DVD release presented two versions of the film, the theatrical widescreen and an anamorphic presentation. Also, included on the DVD is a documentary on the production of the film, an audio commentary track by Rutt and Tuke with an option for visual mode, an artwork gallery narrated by the artists, three deleted scenes, outtakes, two games called "Find Your Totem" and "Bone Puzzle", and the "Fishing Song" performed by Phil Collins. The home video release brought in more than $167 million in DVD and VHS sales and rentals. In April 2004 alone, 5.51 million copies of the film were sold. The film was released in a Blu-ray special edition combined with its sequel, Brother Bear 2, on March 12, 2013. Disney's Brother Bear games were released in November 2003 for Game Boy Advance, PC and mobile phones. The film received mostly mixed reviews from film critics, praising the film's animation but criticizing its story. Review aggregate Rotten Tomatoes reported that 38% of critics gave the film positive reviews based on 125 reviews with an average rating of 5.5/10. The site's consensus is "Brother Bear is gentle and pleasant if unremarkable Disney fare, with so-so animation and generic plotting." Metacritic, which assigns a normalized rating out of 100 from top reviews from mainstream critics, calculated a score of 48 based on 28 reviews, indicating "mixed or average reviews." On the syndicated television show At the Movies, film critics Roger Ebert and Richard Roeper both gave the film positive reviews. Writing in his review for the Chicago Sun-Times, Ebert wrote the film "doesn't have the zowie factor of The Lion King or Finding Nemo, but is sweet rather than exciting. Children and their parents are likely to relate on completely different levels, the adults connecting with the transfer of souls from man to beast, while the kids are excited by the adventure stuff." USA Today film critic Claudia Puig gave the film three out of four stars praising the film for its "message of tolerance and respect for nature rings loud and clear. And family audiences are treated to a vibrantly hued movie with appealing characters." Writing for Variety, Todd McCarthy summarized that "Brother Bear is a very mild animated entry from Disney with a distinctly recycled feel [because] the film's characters and narrative simply fail to engage strong interest, and tale is probably too resolutely serious to enchant small fry in the way the better Disney titles always have." Kenneth Turan, reviewing for the Los Angeles Times, complimented "the richness and fluidity of its visuals" and the "satisfying ending", but derided that "Brother Bear has an appeal that can't be denied. Too often, however, this film's lack of a fresh dramatic approach and not its technique makes it difficult to embrace as much as we'd like to". Of note to many critics and viewers was the use of the film's aspect ratio as a storytelling device. The film begins at a standard widescreen aspect ratio of 1.75:1 (similar to the 1.85:1 ratio common in U.S. cinema or the 1.78:1 ratio of HDTV), while Kenai is a human; in addition, the film's art direction and color scheme are grounded in realism. After Kenai transforms into a bear twenty-four minutes into the picture, the film itself transforms as well: to an anamorphic aspect ratio of 2.35:1 and towards brighter, more fanciful colors and slightly more caricatured art direction. Brother Bear was the first feature since The Horse Whisperer to do a widescreen shift. It was the only animated film to feature this technique, until The Simpsons Movie and Enchanted in 2007. In its limited release, Brother Bear played only in two selected theaters in Los Angeles, California and New York City, grossing $291,940 for a per-screen average of $145,970. The wide release followed on November 1, 2003 expanding to 3,030 theater venues, grossing $18.5 million opening second behind Scary Movie 3 in the box office ranking. On its second wide weekend, the film continued its strong showing grossing $18.6 million against new competing films such as Elf and The Matrix Revolutions, collecting $44.1 million in three weeks. The film made $85,336,277 during its domestic theatrical run and then went on to earn $164,700,000 outside the United States, bringing its worldwide total to $250,383,219. The film was nominated at the 76th Academy Awards for Best Animated Feature, but lost to another Walt Disney Pictures film, Finding Nemo. The song "Welcome" written by Phil Collins was later used as the theme song for Walt Disney's Parade of Dreams during the Happiest Homecoming on Earth, celebrating the 50th anniversary of Disneyland. For the parade, the song had slightly changed lyrics and was performed by an ensemble. ^ "Brother Bear (2003)". The Wrap. Retrieved December 22, 2016. ^ a b "Brother Bear". Box Office Mojo. Retrieved 2015-08-02. ^ a b Lenburg, Jeff (2009). The Encyclopedia of Animated Cartoons Third Edition. Infobase Publishing. ISBN 0-8160-6599-3. ^ a b c d e f g Jessen, Taylor (October 23, 2003). "Fraternal Obligation: Disney Revisits the Animal Picture with 'Brother Bear'". Animation World Magazine. Retrieved July 6, 2015. ^ Moger, Roger (October 25, 2003). "Great Expectations". Orlando Sentinel. Retrieved July 6, 2015. ^ a b EW Staff (August 14, 2003). "Brother Bear". Entertainment Weekly. Retrieved July 6, 2015. ^ a b "Brother Bear: Production Notes – About the Production". Cinema Review. Retrieved July 6, 2015. ^ "Brother Bear: Production Notes - Nature Calls". Cinema Review. Retrieved July 6, 2015. ^ a b Hill, Jim (September 4, 2012). "Why For was Michael Clarke Duncan's Grizz character cut out of Disney's "Brother Bear"?". Jim Hill Media. Retrieved July 6, 2015. ^ Smith, Liz (March 13, 2001). "Isaak Surfing the Ironic / For Phoenix, life's a bear". Newsday. San Francisco Gate. Retrieved July 6, 2015. ^ Billington, Linda. "'Brother Bear' mixes nature, Native culture". Anchorage Daily News. Archived from the original on November 3, 2003. Retrieved July 6, 2015. ^ Wloszczyna, Susan (October 29, 2003). "Looks like a bear market for 2-D animation". USA Today. Retrieved January 1, 2009. ^ "Das Interview mit Ruben Aquino, Supervising-Animator (English transcript)". OutNow.CH. February 5, 2007. Archived from the original on April 17, 2009. Retrieved January 3, 2009. ^ a b Brother Bear: Bonus Features: Art Review (DVD). Buena Vista Home Entertainment. 2004. ^ Moore, Roger (November 1, 2003). "A Genesis For Phil Collins". Orlando Sentinel. Retrieved July 6, 2015. ^ Cohn, Angel (October 27, 2003). "Phil Collins Bearly Sings". TV Guide. Retrieved July 6, 2015. ^ "Tina, Phil In 'Great Spirits' On Soundtrack". Billboard. July 23, 2003. Retrieved July 6, 2015. ^ "Diverse Acts Interpret Collins For 'Brother Bear'". Billboard. October 8, 2003. Retrieved July 6, 2015. ^ Eller, Claudia; Verrier, Richard (March 19, 2002). "Disney Confirms Animation Cuts". Los Angeles Times. Retrieved July 6, 2015. ^ Hill, Jim (January 6, 2003). "Why "Treasure Planet" tanked". Jim Hill Media. Retrieved July 6, 2015. ^ DiOrio, Carl (July 15, 2003). "Inside Move: Disney wakes 'Bear' for Sat. bow". Variety. Retrieved July 6, 2015. ^ "Collins, Turner Lead Disney Premiere". Billboard. October 21, 2003. Retrieved July 6, 2015. ^ Desowitz, Bill (March 30, 2004). "Brother Bear Reborn on DVD". Animation World Magazine. Retrieved July 6, 2015. ^ Chaney, Jen (January 23, 2005). "The Year on DVD and Tape". Washingtonpost.com. Retrieved April 27, 2010. 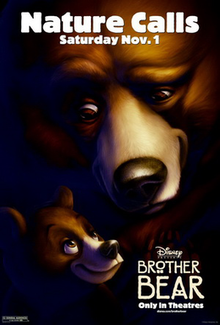 ^ "Brother Bear (2003) - News". IMDb. Retrieved July 16, 2010. ^ "Brother Bear / Brother Bear 2 (3-Disc Special Edition) [Blu-ray / DVD] (2013)". Amazon.com. Retrieved April 12, 2014. ^ "Brother Bear". Rotten Tomatoes. Retrieved May 30, 2014. ^ "Brother Bear Reviews". Metacritic. CBS Interactive. Retrieved July 6, 2015. ^ Ebert, Roger (October 31, 2003). "Brother Bear (2003)". Ebert Digital LLC. Retrieved May 30, 2014. ^ Puig, Claudia (October 23, 2003). "'Brother Bear': Warm, fuzzy fun". USA Today. Retrieved July 6, 2015. ^ McCarthy, Todd (October 19, 2003). "Review: 'Brother Bear'". Variety. Retrieved July 6, 2015. ^ Turan, Kenneth (October 23, 2003). "Old school 'Brother Bear'". Los Angeles Times. Retrieved July 6, 2015. ^ Desowitz, Bill (October 27, 2003). "Nothing Scary About Brother Bear's Roaring Start". Animation World Magazine. Retrieved July 6, 2015. ^ EW Staff (November 7, 2003). "Scary Movin'". Entertainment Weekly. Retrieved July 6, 2015. ^ Lowe, R. Kinsey (November 3, 2003). "'Scary' shovels in the cash". Los Angeles Times. Retrieved July 6, 2015. ^ Holson, Laura (November 10, 2003). "An Elf and a Bear Trip Up the Final 'Matrix'". The New York Times. Retrieved July 6, 2015.